The NFL would have you believe it woke up. 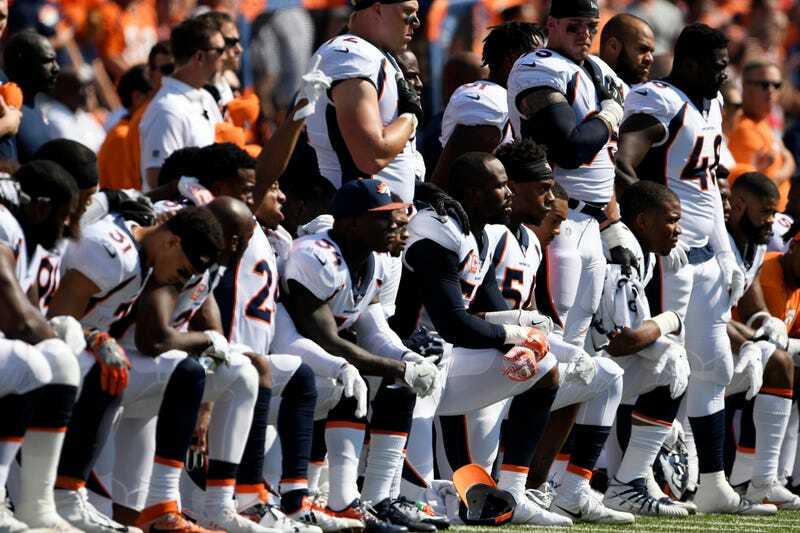 After weeks of NFL owners trying to appease their players and their racist fans, too, the league has decided that players can continue to kneel during the national anthem to call attention to racial injustice without penalty. The decision came after a meeting Tuesday afternoon in New York City between NFL Commissioner Roger Goodell and NFL owners and the players and their union reps. Previously, Goodell and owners had floated changing league rules concerning players’ conduct while the anthem was playing. An NFL rule book required players to be on the sideline while the song was being played, but didn’t exactly mandate that they stand. It’s a major decision following weeks of controversy and mixed messages. But according to the New York Times, Goodell and the players said they didn’t spend much time discussing the protests themselves. Both sides called the meeting productive. Tuesday’s meeting capped a busy few days for the NFL when, once again, the play on the field wasn’t what generated the most headlines. Former San Francisco 49ers quarterback Colin Kaepernick, the player whose 2016 protest against police brutality and racial injustice generated the #TakeAKnee movement, on Sunday filed a grievance against the league, claiming that the league colluded against him. On Monday the NFL endorsed a key criminal-justice-reform bill. For now the players said that they expect to continue to meet with the owners to effect meaningful change in their communities. Jenkins told reporters that Kaepernick had been invited to the meeting but chose not to attend. The Times reports that Kaepernick’s lawyer, Mark Geragos, said that Kaepernick may attend future meetings.